I confess to having not seen Super Troopers until having to do this review, I also confess to laughing all of twice Those two laughs occurred within the first ten minutes. In this instance, it’s difficult to say whether Super Troopers just wasn’t to my taste, or simply had poorly written gags. I think - and frankly, want to believe - that it was the former. The film is seventeen years old now and from my perspective, comedies from the mid-2000s age quite poorly. Maybe I would have more of an appreciation for it had I seen it back in the day. At any rate, seventeen years is a long time for a comedy sequel, which made me more than curious to see how Super Troopers 2 would adapt to current times, if at all. It did. Not in the way I was expecting, mind. Super Troopers 2 has more of a plot than the first film, though that is neither praise nor a criticism. The story, such as it is, involves the border separating Vermont and a small town in Canada being altered, meaning that this small French-Canadian town will become part of America. The residence not being too happy about it, naturally. The humour keeps the style of the first, with more of a naturalistic dryness. It’s a hard thing to articulate because the best jokes come from the banter between the characters, and the differences between America and Canada. I laughed much more this time round. If I were to cynically create, say, a pie chart based on what jokes landed and which didn’t, I would estimate that it would be two-thirds of jokes that didn’t. But then, this is a film in which the villain monologues while a character is tied to a log saw (I’m not even sure whether it was supposed to be satirical). Is it funny? That’s the main question. Or, rather, is it funny enough? For me, no. There is a lot to suffer through for periodical laughs. The chemistry between the leads is great, and the highlights come from them simply interacting with each other, but they can’t support the rest of the film. 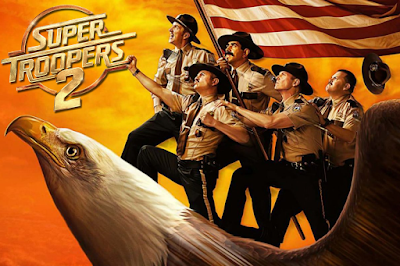 Maybe if you’re still in your mid-to-late teens you’ll get something out of Super Troopers 2 that I just couldn’t. Maybe I’m just too old to find shaving someone else's scrotum inherently funny.